This page (together with the documents referred to on it) tells you the terms and conditions (Terms) on which we provide travel and accommodation services via access to and use of our website hosted at workinayianapa.com (our site) to individuals seeking our assistance (Clients, you, yours) in the arrangement of workers packages, which involves the provision of long stay accommodation and assistance with finding vacation work abroad (Services). Please read these Terms carefully before using Services or other material available from our site. You should understand that by using any of our Services, you agree to be bound by these Terms, to the exclusion of any other terms and conditions. If you are happy to book your working holiday package with us on the basis of these terms and conditions, you will need to check the box indicating your acceptance where indicated. Please note that if you refuse to accept these Terms, you will not be able complete your booking. But if you do accept these Terms and successfully complete your booking (which happens when we send you an email setting out the booking confirmation), there will be a legally-enforceable Contract between you, our client, and us. Work in Ayia Napa is a travel and accommodation service. We facilitate, develop, create and promote opportunities for students to find vacation work abroad and find long-stay holiday accommodation. Work in Ayia Napa is a Cypriot company based in Cyprus registered address Agiou Ilarionos 2, Nicosia 1026, Cyprus. 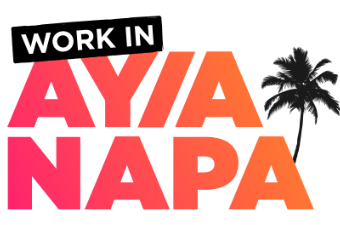 The website hosted at www.workinayianapa.com (Site) is operated by the owners of Work in Ayia Napa Giannis Markou. You will use our site only for the purpose of using and accessing Services. Assist you to find vacation work. In return for our provision of the Services, you will pay to us the Fees, which are made up of a non-refundable Booking Deposit, which you will pay to us when you make your Booking, and the Balance, which is due no later than 6 weeks prior to the start of your working Holiday. We may also require you to pay a Breakages Deposit, which will be refunded to you on or shortly after your holiday ends, subject to these Terms. Where applicable, all fees quoted on our Site include value added tax or any replacement or equivalent sales-related tax. You may cancel your booking at any time prior to the start of your Holiday, subject to the terms of our Cancellation Policy. We may offer you other goods or services or provide you with the opportunity to purchase other goods and services from third parties during your Holiday. Where such purchases are itemised in the Booking process, they will be subject to these terms and conditions but please be aware that further terms may apply, as documented on our Site. Purchases made after you make the Booking will be subject to further terms to be agreed between us at the time. These terms and conditions shall not apply to those subsequent purchases unless we specifically confirm that they will. Where any payment is not made in accordance with these Terms, we may withhold or suspend the Services (including the arranging of placements or the supply of ancillary services) until the position is rectified and/or or may terminate the relevant Contract. Where you buy additional services from third parties, such as travel insurance, booking accommodation, flights either booked direct with other companies or through our recommendations, you need to check the terms and conditions presented by those third parties. For additional services, you will always pay direct to those third parties the fees as indicated with their services. We will not be liable for any loss or damage you suffer as a result of the provision of services by third parties under any circumstances. We cannot guarantee continuous or secure access to our Site and we give no representations or warranties (whether express or implied) about the availability of our Site. You warrant that you will not disclose any username or password created by or issued to you to any third party for any purpose. Where the provision of the accommodation services involve the sending of SMS text messages to you or individuals specified by you, you consent to our use of SMS text messages in communicating with you and you warrant to us that you have obtained the consent of all such individuals to the receipt of those SMS text messages. You may occupy the property (Property) that we provide for your working holiday and you may make use of the furnishings, kitchen equipment, crockery, glasses, bedding and towels (Contents) as set out in an inventory that you must sign and provide to our representative on your arrival at the Property at the start of your Holiday. The Property will be available for you from 4:00pm on the day on which you are due to arrive (Arrival Date). On the day you are due to depart (Departure Date), you must vacate the Property by 11:00am. This means that you must remove all your luggage and items of your personal property. If you fail to do so, we may, at our discretion, charge you for an extra day’s accommodation. If your return flight (or other onward travel plans) is much later in the day, we may be able to arrange storage of your luggage but we cannot promise this as facilities vary from resort to resort. Stored luggage is left with us at your risk and you should make sure that any luggage that you leave with us is covered by your insurance just in case of loss or damage. The €50 Breakages Deposit will be held by us to be applied against the reasonable repair or replacement and cleaning of furnishings, kitchen equipment, crockery, glasses, bedding and towels damaged or soiled, otherwise than by usual wear and tear, during the Holiday by you. The balance of the Breakages Deposit will be returned to you within 21 days of the Departure Date. We will issue you with one set of keys to the Property on the Arrival Date and you must return them to us no later than 11:00am on the Departure Date. If you lose a key, we will replace it subject to your paying the reasonable cost of having a replacement cut. There is a €10 per week charge for electricity and water. The first 4 weeks are to be paid upfront on arrival. We will remove any items of property and belongings left in the Property after the Departure Date and store those items for a maximum of one month. We will notify you that this has been done by email to the address provided by you during the Booking process. If the items are not collected within one month, we may dispose of the items and you will be liable for the reasonable costs of disposal (and these costs may be deducted from the Breakages Deposit, if we have yet to refund it to you) and if there are any costs remaining they will remain your liability. We confirm that the furniture and furnishings comply with the local fire safety regulations (if any). We confirm that the electrical appliances and equipment provided are safe and will not cause danger and that, within the European Union, all electrical appliances and equipment manufactured after 19 January 1997 are marked with the appropriate CE symbol. We confirm that, where required by local law, a gas safety certificate is available for your inspection. The purpose of the Holidays we arrange is to allow you to earn a living abroad. However, whether you secure employment (or even seek employment at all) is down to you. We will arrange recruitment days, training, ice-breaker parties and other entertainment, which will give you an opportunity to meet other people living or staying in or around the resort and through which you might find out about job openings. Our in-resort representatives (Reps) will, where practicable, also make introductions for you to local employers with whom we are connected. Our Reps will also give you whatever advice they can on working practices and culture and they will warn you of issues of which we believe you should be aware. However, you accept that our ability to do this is limited and that you will need to make informed choices based on your own research. In certain circumstances, you may be required to provide a Criminal Records Bureau check to a potential employer and where you require our assistance in carrying this out, you hereby authorise us on your behalf to make the application for you, to store the report received and to disclose it on your behalf to those who require sight of it in order to process your placement application. We will charge you for the provision of this service in advance at our standard rates, as amended from time to time. You warrant that you are the holder of a passport that is valid currently, for the proposed duration of your placement and for a period of no less than 6 calendar months following your return. You acknowledge that should you fail to adhere to these requirements, you may be refused access to your destination country or any countries through which you must travel to reach your destination. Where your Holiday so requires, you warrant that you are the holder of a full UK driving licence, and that your licence is unendorsed where that requirement is made in the conditions imposed by any third party upon whom your Booking depends. You agree to produce these documents for examination by our Reps (or by us, as applicable) on demand. If you are an EU national and the Holiday you have booked is to take place within the EU, you will not have to concern yourself with work permits and such like, but in every other circumstance, you will need to check the position. If you are NOT an EU national, just because you have the right to reside and study or work in the UK does not necessarily mean you will have similar rights in other EU states. This may mean that you require a work permit or some form of restricted visa rather than a tourist visa. We will not be liable for any shortcoming in your official arrangements save in respect of any fraud or fraudulent misrepresentation on our part. make payment in accordance with these Terms. A contract in relation to the provision of the Services will be formed between you and us on the basis of these Terms when we email you with acceptance of your offer to engage us in the provision of the Services. Certain ancillary services arranged by us on your behalf may be supplied by third parties and will be subject to the terms and conditions applied by those third party providers. We are not registered with the Financial Services Authority (FSA), so we are not in a position to provide financial advice or to sell financial products. However, we strongly recommend that you arrange a suitable insurance policy before you depart for your placement, which as a minimum should provide cover for your baggage, medical attention and expenses and, if necessary, repatriation. For some visas, it is a requirement to show proof of health and travel insurance. Policies recommended by us on our site are those that we have found to provide suitable cover in our experience. However, you are responsible for choosing your insurance policy and you must check the terms of the cover provided. The Contract will relate only to those Services for which payment has been made or which you are making on an ongoing basis. If you wish us to provide similar Services in future, these will be the subject of further contracts between you and us. Each Contract shall last for the period during which the relevant fees are paid by you, subject to the rights of termination in clause 8 and as otherwise set out in these Terms. The fees for our Services will be as stated on the Site from time to time, except in cases of obvious error. Fees are liable to change at any time and are inclusive of Value Added Tax where applicable. Payment of all Fees in relation to the use of the Services must be made via one of the methods described on the Site (these may change from time to time) at the time your Booking is made or otherwise as stated on the Site. The Booking Deposit cannot be refunded in the event that you wish to cancel or vary your Holiday. This Agreement may be terminated before the end of the Holiday by us giving you notice in the event that you breach these Terms or because of fire or some other catastrophic event at the Property or because of some other reason that leaves us with no realistic option other than cancelling (or terminating) your Holiday. In the case of termination otherwise than by reason of your default, we shall return to you the appropriate proportion of the Rent attributable to the then unexpired remainder of the Holiday. being a company, become subject to an administration order (whether out of court or otherwise), go into liquidation (otherwise than for the purposes of solvent amalgamation or reconstruction) or an encumbrancer takes possession of, or a receiver or administrator is appointed over, any of your property or assets or you cease to trade. You agree that we shall have no liability to you for any loss you may incur as a result of us taking any action as is set out in this clause 8. Upon termination of a Contract, you may find your access to our Site is restricted. We will not make any variations to your Holiday or other travel or accommodation arrangements on or after your Departure Date unless it is necessary to do so for reasons beyond our control, in which case we will use reasonable endeavours to make suitable alternative arrangements for you. Should it become necessary to change the accommodation arrangements for your Holiday we will arrange accommodation of equivalent quality in a nearby location. If you do not wish to accept the substitute accommodation, we will refund the Fees to you, less our Variation Fee, as detailed on the Site and as amended from time to time. We may be able to vary placement, travel or accommodation arrangements prior to your Departure Date, subject to payment by you of our Variation Fee. Save where expressly provided to the contrary in these Terms, our liability for losses you suffer as a result of us breaking the terms of any Contract is strictly limited to the Fees paid by you in relation to the specific Services you purchased in relation to that Contract. for any loss of profit, reputation, opportunity, goodwill, business or anticipated savings or any indirect, special or consequential loss, damages, costs, expenses or other claims (whether caused by the negligence of us, our servants or agents or otherwise) which arise out of or in connection with the provision, late provision of or failure to provide the Services and/or their use by you. You acknowledge that we are not responsible for your health and safety during your Holiday. When you engage in activities during your Holiday such as, without limitation, driving vehicles or participating in sports of any description, you do so at your own risk. any infringement by you of the rights of any third party for which we are made liable or in respect of which we are required to take action (such as hiring lawyers). Applicable laws require that some of the information or communications we send to you should be in writing. When using our site, you accept that communication with us will be mainly electronic. We will contact you at our discretion by SMS text message, email or provide you with information by posting notices on our website. For contractual purposes, you agree to this electronic means of communication and you acknowledge that all contracts, notices, information and other communications that we provide to you electronically comply with any legal requirement that such communications be in writing. This condition does not affect your statutory rights. Once you have paid your deposit you will be charged the full amount due of the remaining balance subject to the payment schedule. If you do not pay the required amount by the second payment date, or you have not paid in full by the final balance date, and have not informed us of a cancellation, you will be subject to an automatic late payment fee of £25 per person. Second payment (£100) Payable 5 weeks after booking or by 1st Jan 2018 if booking prior to 31st September 2017. Third (Final) payment (£229) Payable 6 weeks before departure. If you are travelling within 6 weeks of booking then payment in full is required at time of booking. We act as agents for the accommodation owners in Cyprus. Any money we pay the various owners are NON REFUNDABLE. Therefore our policy is that there are no refunds on money paid under any circumstances regardless of the reason. Or length of time between booking or length of time until arrival. Each Contract between you and us is binding on you and us and on our respective successors and assigns. No waiver by us of any of these Terms shall be effective unless it is expressly stated to be a waiver and is communicated to you in writing in a manner provided for under these Terms. Where we are required to make changes to our policies, terms and conditions or other documents by law, you will be subject to those changes even if they are made after you have made your booking. Apart from that, your booking is made subject to the policies and terms and conditions in force at the time that your order for Services from us is accepted by us. A person who is not a party to a Contract has no rights under the Contracts (Rights of Third Parties) Act 1999 to enforce any term of that Contract, but this does not affect any right or remedy of a third party which exists or is available apart from that Act. All Contracts made under these Terms are governed by English law. Any dispute arising from, or related to, such Contracts shall be subject to the non-exclusive jurisdiction of the courts of England and Wales.